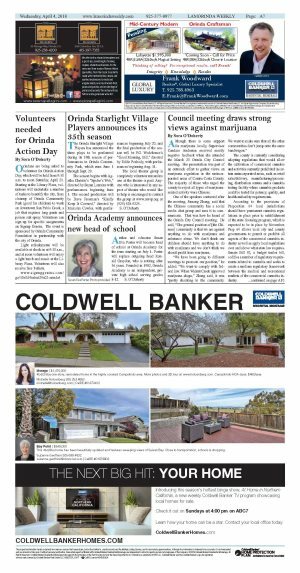 Although there is some support for marijuana locally, Supervisor Candace Andersen received mostly negative feedback when she attended the March 20 Orinda City Council meeting. Her presentation was part of an outreach effort to gather views on marijuana regulation in the unincorporated areas of Contra Costa County. The majority of those who urged the county to reject all types of marijuana-related activity were Chinese. One of the speakers contacted after the meeting, Jinsong Zhang, said that the Chinese community has a social media chat group and uses it to communicate. That was how he heard of the Orinda City Council meeting. He said, "The general position of [the Chinese] community is that we are against anything to do with marijuana and substance abuse. We don't think our children should have anything to do with marijuana and we don't think we should profit from marijuana. "We have been going to different meetings to promote our position," he added. "We want to comply with federal law. When Walnut Creek approved marijuana shops," Zhang said, it was "pretty shocking to the community. We want to make sure that all the other communities don't jump onto the same bandwagon." The county is currently considering adopting regulations that would allow the cultivation of commercial cannabis and activities currently prohibited in certain unincorporated areas, such as retail sales/delivery, manufacturing/processing, distribution centers and a cannabis testing facility where cannabis products could be tested for potency, quality, and health and safety requirements. According to the provisions of Proposition 64 local jurisdictions should have permanent cannabis regulations in place prior to establishment of the state licensing program, which is expected to be in place by November. Prop 64 allows local city and county governments to permit or prohibit all aspects of the commercial cannabis industry as well as apply local regulations over and above what state law requires. Senate Bill 92, a budget trailer bill, codifies a number of regulatory requirements related to cannabis and seeks to create a uniform regulatory framework between the medical and recreational markets of the commercial cannabis industry. It is anticipated that no commercial cannabis uses would be authorized by Contra Costa County until such time as a cannabis tax ballot measure has been approved by county voters. A county cannabis tax initiative could be considered by voters at the next general election in November, so regulations permitting commercial cannabis uses are not expected to become effective until that time at the earliest. Debbie Barnett spoke on behalf of ADAPT, the Alcohol Drug Abuse Prevention Team, at the March 20 council meeting and suggested a buffer of one mile from incorporated lands. According to the draft report prepared by the Contra Costa County Department of Conservation and Development for the County Board of Supervisors current state law requires a buffer of 600 feet between any cannabis business licensed by the state and any K-12 school, day care center or youth center. A county ordinance may increase this buffer distance and may also establish buffers between cannabis businesses and other sensitive uses, such as parks. Gracie Chen, who is a student at Orinda Intermediate School, stated she feels that more legalization of marijuana will promote teen use, citing higher use by teens in states where marijuana is legal. Other speakers brought up concerns about how they might be exposed to marijuana grows while running on trails outside city limits, or the potential use of pesticides and poisons in outdoor grows, water use concerns during drought years, how there is already an excess of marijuana in California. City Council Member Darlene Gee generally agreed with the speakers' points of view. Gee doesn't think that the benefits outweigh the costs of commercial marijuana regulation. She prefers consistency with the regulatory approach of the city. Mayor Amy Worth agreed with speakers who talked about runners being exposed to marijuana grows when their trails take them outside the city limits. Vice Mayor Inga Miller agreed about areas near schools and trails, but acknowledged that 60 percent of voters in the area voted in favor of legalizing marijuana, so she thought that perhaps remote areas of the county would be acceptable. Council Member and runner Eve Phillips said that Contra Costa is not an agricultural county and so doesn't seem like the county for growing marijuana. While several other meeting attendees expressed their concerns about marijuana cultivation and use, resident Harlan Van Wye said that "prohibition of marijuana is just plain stupid." He said there is a lot of misinformation being distributed, but that the voters approved recreational use of marijuana. "The people have spoken," he added, "and they want marijuana reasonably available and reasonably regulated." 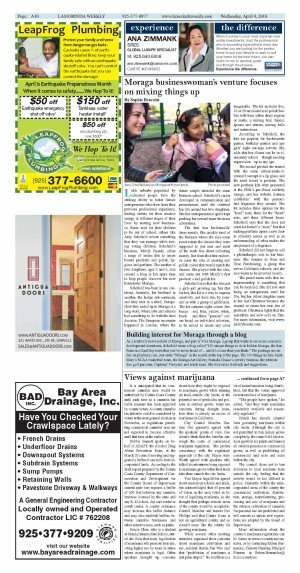 Orinda has already adopted laws governing marijuana within city limits. Although the city is not permitted to ban indoor grows completely, the council did limit indoor grows to six plants and banned all outdoor personal or commercial grows, as well as prohibiting all commercial land uses and sales within the city. The council chose not to ban deliveries to local residents from outside the city, finding that the activity would be too difficult to police. Currently within the unincorporated areas of the county the commercial cultivation, distribution, storage, manufacturing, processing and sale of marijuana and the outdoor cultivation of cannabis for personal use are prohibited and will remain so unless new regulations are adopted by the Board of Supervisors. More information about the county's marijuana regulations can be found at www.cccounty.us/cannabis, or by contacting Ruben Hernandez, Current Planning Principal Planner, at Ruben.Hernandez@dcd.cccounty.us.